Several years ago I kept reading and listening to folks speak about eagles. I was fascinated by the majestic creature. Of course, Isaiah 40:28-31 is one of my favorite Scripture passages. Wow, how many times have I failed to wait for Holy Spirit and just started "flapping my wings" doing something I shouldn't or "flapping my mouth", when I should be quiet and wait? I'm learning to obey the Spirit for the right thing, the right word and the right time! Can you relate? “When storm clouds gather, eagles get excited. An eagle uses the storm’s wind to lift himself higher, far above the clouds. We can use the storms of life to rise to greater heights." Oh how I want to allow Holy Spirit the space in my mind and heart to lift me above the problems and cares of this world, so I can rise above the storms! 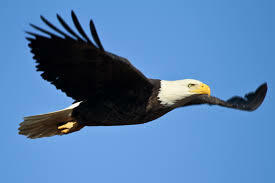 "During the time of training her young ones to fly, a mother eagle throws the eaglets out of the nest. Because they are scared, they jump into the nest again. Next, the mother eagle pushes the eaglets off the cliff into the air. As they shriek in fear, father eagle flies out and catches them up on his back and brings them back to the cliff. This goes on for some time until they learn to start using their wings to fly." It’s not easy when the Lord throws you into something new, but He is always there to catch us! The free-fall of learning something new and trusting Him in a totally new way is so worth it! This is part of the abundant and exciting life that God has in store for each one of us! I pray that as you reflect on a few characteristics of eagles, that you will read Isaiah 40:31 with fresh understanding and revelation. 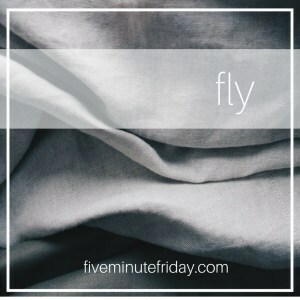 This post is part of Kate Motaung's "Five Minute Friday," which she hosts on the Five Minute Friday website. Kate posts a single word each week and each blogger sets a timer for 5 minutes to write and then posts, with very little editing. Check out the other writers this week!